The AR 15 has been available to the general public for over fifty years, and in that time has been available in a bewildering array of configurations. One of the most popular today is the so-called “flat top” version, which replaces the traditional carrying handle with built in iron sights for a Picatinny railed upper receiver which can accept any number of mounting arrangements for sights and optics. This leaves many people asking what is the best scope mount for their AR 15? Picatinny rails provide a very stable mounting platform, but sometimes require tools to properly install an accessory. This quick detach AR 15 scope mount only requires fingers. Once you’ve placed the mount where you want, simply press the locking levers down, and it’s firmly mounted in place. Featuring offset rings for optimal eye relief and capable of taking both 30mm and one inch scope tubes (using provided adapters), this high quality scope mount is jammed packed with desirable features, and combined with its low price, is clearly one of the best scope mounts for AR15 rifles on the market. Not everyone uses a big, long scope. Compact scopes can deliver tack driving accuracy and performance without taking up much real estate on your rifle. Because many of the best AR 15 scope mounts are one piece, if you are running a compact scope, you’d need a mount with the rings placed at the correct distance. Designed to fit both popular 30mm tubes and common 1 inch tubes, this aircraft aluminum alloy mount attaches to your rifle with a single screw, and will provide a rock solid platform for your optic of choice. 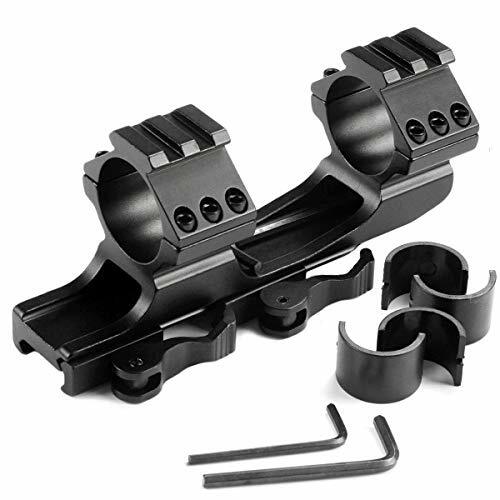 I like saving the best for last, this set of Nikon rings are some of the best scope mounts for AR 15 rifles available to the shooting public. Made for the most common one inch scope tubes, reversible for ultra-compact scopes, and built of rugged aluminum alloy, it is hard to find fault with these Nikon rings. 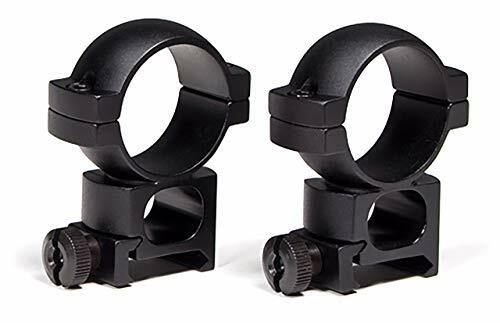 Best suited for shooters who need the flexibility of a two piece scope mounting system, and who appreciate the top shelf quality Nikon delivers, these outstanding rings will mount nearly any one inch scope you can find to your AR. Quick: name three things you want in the best AR 15 scope mount? How about low price, a high profile to take even the most outrageous and oversized scopes, and 30mm rings so you can take advantage of popular scopes for the AR 15? Made of a rugged, long lasting and lightweight aluminum alloy, the Vortex scope mount delivers high end performance and is a central part to turning your AR 15 into a long range tack driver. With a great price, this mount takes advantage of the latest mass production technology to save you money. Do I Need an Offset Mounted Scope? Maybe, maybe not. 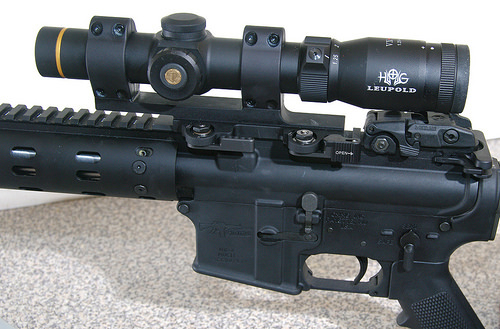 Many of the best AR 15 scope mounts mount the scope at an offset angle to allow clearance for large objective lenses. 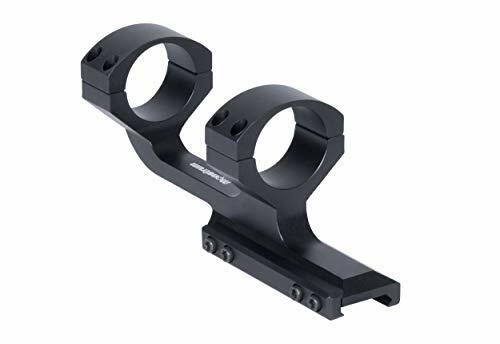 Offset mounts are especially popular in three gun competitions where large scopes are commonly used to quickly acquire a target and for the benefit of their larger sight picture. As a rule, if you use a scope with an overly large objective lens then you want an offset scope mount. What Makes the Best AR 15 Scope Mount? This is one of the great questions for the ages because best is subjective to personal preference and end use. However, there are a few things that will be present in nearly all AR 15 scope mounts. Scopes for AR 15 rifles come with either 30mm or one inch tubes. While the absolute best AR 15 scope mount will be dedicated to either 30mm or one inch tubes, many can be adapted to take either one. Since the tiny difference in potential accuracy between a dedicated ring, or one with an adapter for a smaller size is unimportant to most shooters, many people prefer a mount that can take 30mm or one inch tubes. Not only is this a money saver, but it allows a shooter to change optics on their rifle for different jobs without investing in multiple scope mounts, thus reducing clutter and redundant parts. Many of the best AR 15 scope mounts are one piece units. That means they incorporate the rings and base into one unit which in turn is attached to the Picatinny rail on many AR 15 upper receivers. The one piece design is most useful as there is no need to manually adjust ring location, and can be taken off with the already zeroed and installed scope as a single unit. Some one piece units also have the added feature of quick detach levers, which lock the mount down and unlock it with the manipulation of a lever, while other units require a screwdriver or hex wrench to install. Some people will prefer more traditional two piece ring assemblies, which allow the shooter to more carefully customize their scope and ring placement. This is most useful for unusually long or short scopes, or simply because of personal preference. 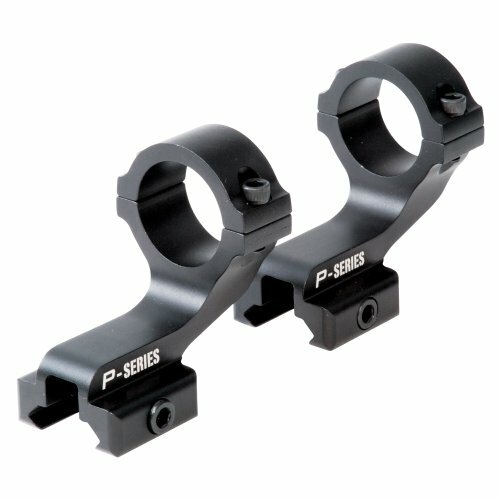 Ultimately, the best scope mounts for AR15 rifles will incorporate most of these features, be made of a high quality aluminum alloy for lightweight performance and durability, be a high enough profile to clear a stock front sight if installed, and may be offset to allow the use of oversized optics. With all the fantastic choices out there, with a little effort, you are bound to find the best AR 15 scope mount for your purposes. Thank You! Glad to see someone say something without dragging it out to the length of War and Peace. And I thought I was the only one that appreciated Readers Digest.